Having coined the name ‘HandPan’, as a means through which to describe their Hang-inspired instruments to the world, without using the ‘H’ word, Kyle Cox of Pantheon Steel, also set about creating an appropriate logo, generic in nature, to accompany the newly coined HandPan moniker. 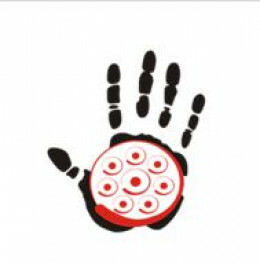 A HandPan pictogram consisting of black hand-print image, with a red HandPan inset within the palm, this generic HandPan logo is both explanatory, and stylish. And while it shares the same color scheme commonly used by Pantheon Steel for their own ‘Halo’ logo, and associated accessories. As far as is known (though it’s probably worth checking with Pantheon Steel first should you intend to use it for your own purposes), this specific logo was always intended for use within the HandPan community as a whole, for as and when 'HandPan' needed to be expressed graphically.